TOUR GUIDE RESPONSE: Dear Haroon, Thank you very much for your kind review. I'm glad to know that you enjoyed the tour. It was really lovely meeting you and your wife. I hope to see you again in the future. Warmest regards, Katsuko O.
Katsuko was wonderful. She was so informative and molded the itinerary to all the sights we wanted to see. We had the best day exploring Kyoto with Katsuko. TOUR GUIDE RESPONSE: Dear Becky, Thank you very much for your kind review. It was really lovely meeting you and I enjoyed the day with you a lot. I'm glad that we were blessed with the weather. I hope to see you again in the future. Best wishes, Katsuko O.
Katsuko gave very clear directions of the meeting point. She customised the tour based on our interests. Overall, a great tour. TOUR GUIDE RESPONSE: Dear Hoe, Thank you very much for your kind review. It was really nice meeting you and I enjoyed the day and the conversation with you a lot. Thank you for coming to Japan many times and I sincerely hope to see you again in the future. Best wishes, Katsuko O.
Katsuko was very knowledgable on the history and the layout of Kyoto. We were able to customize the tour to see everything that we wanted, including some scenic walks in between the major sites. Highly recommend this tour. Thanks Katsuko! TOUR GUIDE RESPONSE: Dear Pearce, Thank you very much for your kind review. I'm glad to know that you enjoyed the tour. Also thank you for walking a lot during the tour to see everything in one day. It was really nice meeting you and I truly hope to see you again in the future. 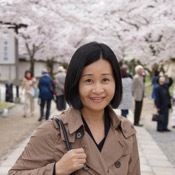 Best wishes, Katsuko O.
Katsuko provided two days of fabulous tours, covering the cultural and historical highlights, while providing the history of Kyoto, as well as Japan. She arranged a tea ceremony and a sake tasting for us, and we visited Japanese restaurants for lunch. We are leaving Kyoto with a richer knowledge of the city and it's people. Katsuko was a wonderful guide. She suggested an itinerary for us that was great for the whole family and she provided a lot of interesting history and cultural background for the places we visited and Kyoto in general. She also followed up after the tour with an email giving some further details about some of the options we discussed for our remaining time in Kyoto. We could not have asked for more. Thank you Katsuko! TOUR GUIDE RESPONSE: Dear Lucy, Thank you very much for your kind review. It was so nice meeting you all. Your children are so sweet and I felt so happy when I saw their greetings in Japanese when we first met in the morning. Please take care, and I hope to see you again sometime in the future. Best wishes, Katsuko O. TOUR GUIDE RESPONSE: Dear Jeffrey, Thank you very much again for your kind review. I'm glad to know that you enjoyed the tour. I had a wonderful time with you too and really enjoyed the conversation with you about various topics including films. Please take care, and I sincerely hope to see you again sometime in the future. With best wishes, Katsuko O.
Katsuko not only fulfilled our expectations, she surpassed them. Her knowledge, insight, and courtesy were stellar. She provided what we asked of her, and even rolled with the punches as the heat made us change our plans. She gave me a day I will never forget. TOUR GUIDE RESPONSE: Dear Jeffrey, Thank you very much for your kind review. It was so nice meeting you and I really enjoyed the two days with you. The appreciation you showed toward a different culture was a great source of motivation for me. I'm glad that we all survived the heat, and I also enjoyed your witty conversation! I hope to see you again sometime in the future. Warmest regards, Katsuko O. We had a great full-day-tour with our guide Katsuko O. We've been to Kyoto a number of times and wanted some new experiences. She had planned the day perfectly (and checked the plan with us before we went) and that included a trip to Uji, a fantastic teppanyaki-steakhouse lunch and some sake-tasting. She knew the places, she gave some great service (sprayed us with insect repellant before a mosquito heavy shrine and so on) and most importantly for us - we enjoyed some really fun conversations. TOUR GUIDE RESPONSE: Dear Mats, Thank you very much for your kind review. It was so nice meeting you and I'm pleased to know that you enjoyed the tour. I also really enjoyed the time with you and your wife, visiting the beautiful sites together. I wish you come back to Japan sometime soon. I'll try and find new hidden gems in Kyoto by them! Warmest regards, Katsuko O.
I would like to commend Katsuko in Kyoto Japan I give her 100% 5 stars rating Her english was good Her knowledge was excellent She was available on the phone and was on time and reliable She gave a full 8 hour tour of Kyoto and showed us the best sites and gave us insight into Japanese culture Well Done! TOUR GUIDE RESPONSE: Thank you very much for coming to Kyoto by traveling such a long distance. Also Many for your kind review. It was really nice meeting you and I truly enjoyed the tour with you. Hope to see you again sometime in the future. Warmest Regards, Katsuko O.